DateTools was written to streamline date and time handling in iOS. Classes and concepts from other languages served as an inspiration for DateTools, especially the DateTime structure and Time Period Library for .NET. Through these classes and others, DateTools removes the boilerplate required to access date components, handles more nuanced date comparisons, and serves as the foundation for entirely new concepts like Time Periods and their collections. The following bundle is necessary if you would like to support internationalization or would like to use the "Time Ago" functionality. You can add localizations at the Localizations subheading under Info in the Project menu. DateTools.h contains the headers for all the other files. Import this if you want to link to the entire framework. One of the missions of DateTools was to make Date feel more complete. There are many other languages that allow direct access to information about dates from their date classes, but Date (sadly) does not. It safely works only in the Unix time offsets through the timeIntervalSince... methods for building dates and remains calendar agnostic. But that's not always what we want to do. Sometimes, we want to work with dates based on their date components (like year, month, day, etc) at a more abstract level. This is where DateTools comes in. If you know a language not listed here, please consider submitting a translation. Localization codes by language. This project is user driven (by people like you). Pull requests close faster than issues (merged or rejected). Thanks to Kevin Lawler for his work on NSDate+TimeAgo, which has been officially merged into this library. There is a lot of boilerplate associated with getting date components from an Date. You have to set up a calendar, use the desired flags for the components you want, and finally extract them out of the calendar. The date editing methods in DateTools makes it easy to shift a date earlier or later by adding and subtracting date components. For instance, if you would like a date that is 1 year later from a given date, simply call the method dateByAddingYears. These methods are great for comparing dates in a boolean fashion, but what if we want to compare the dates and return some meaningful information about how far they are apart? Date comes with two methods timeIntervalSinceDate: and timeIntervalSinceNow which gives you a double offset representing the number of seconds between the two dates. This is great and all, but there are times when one wants to know how many years or days are between two dates. For this, DateTools goes back to the ever-trusty NSCalendar and abstracts out all the necessary code for you. Just for kicks, DateTools has a few convenience methods for quickly creating strings from dates. Those two methods are formattedDateWithStyle: and formattedDateWithFormat:. The current locale is used unless otherwise specified by additional method parameters. Again, just for kicks, really. Dates are important, but the real world is a little less discrete than that. Life is made up of spans of time, like an afternoon appointment or a weeklong vacation. In DateTools, time periods are represented by the TimePeriod class and come with a suite of initializaiton, manipulation, and comparison methods to make working with them a breeze. Time peroids consist of an Date start date and end date. To initialize a time period, call the init function. or, if you would like to create a time period of a known length that starts or ends at a certain time, try out a few other init methods. The method below, for example, creates a time period starting at the current time that is exactly 5 hours long. Time periods may also be manipulated. They may be shifted earlier or later as well as expanded and contracted. 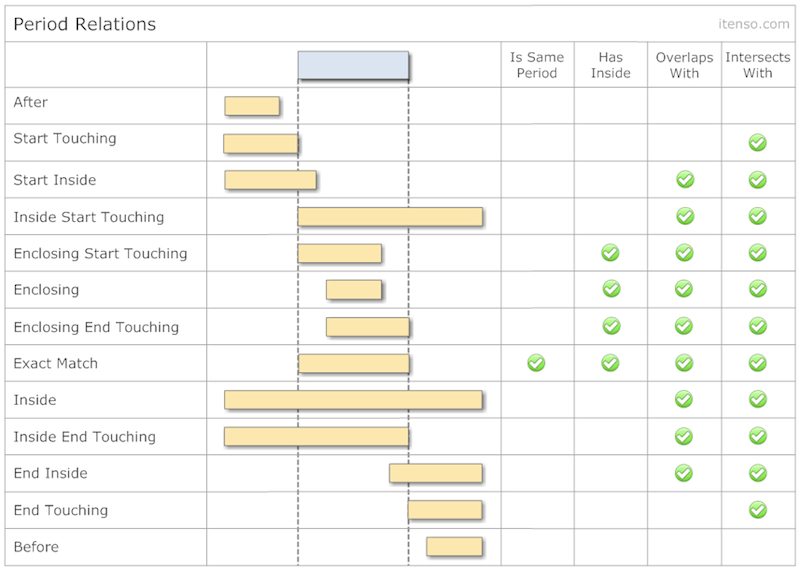 When a time period is shifted, the start dates and end dates are both moved earlier or later by the amounts requested. To shift a time period earlier, call shiftEarlierWithSize:amount: and to shift it later, call shiftLaterWithSize:amount:. The amount field serves as a multipler, just like in the above initializaion method. When a time periods is lengthened or shortened, it does so anchoring one date of the time period and then changing the other one. There is also an option to anchor the centerpoint of the time period, changing both the start and end dates. This doubles a time period of duration 1 minute to duration 2 minutes. The end date of "now" is retained and only the start date is shifted 1 minute earlier. There may come a need, say when you are making a scheduling app, when it might be good to know how two time periods relate to one another. Are they the same? Is one inside of another? All these questions may be asked using the relationship methods of TimePeriod. All of the possible relationships have been enumerated in the TimePeriodRelation enum. For a better grasp on how time periods relate to one another, check out the "Time Periods" tab in the example application. Here you can slide a few time periods around and watch their relationships change. Time period groups are the final abstraction of date and time in DateTools. Here, time periods are gathered and organized into something useful. 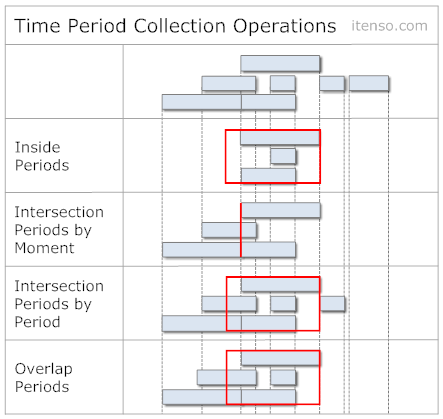 There are two main types of time period groups, TimePeriodCollection and TimePeriodChain. At a high level, think about a collection as a loose group where overlaps may occur and a chain a more linear, tight group where overlaps are not allowed. Both collections and chains operate like an NSArray. You may add,insert and remove TimePeriod objects from them just as you would objects in an array. The difference is how these periods are handled under the hood. Time period collections serve as loose sets of time periods. They are unorganized unless you decide to sort them, and have their own characteristics like a StartDate and EndDate that are extrapolated from the time periods within. 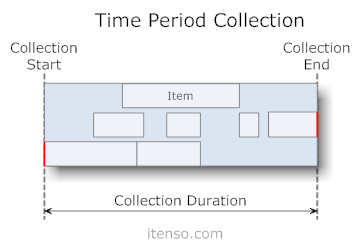 Time period collections allow overlaps within their set of time periods. It is also possible to check an Date's or TimePeriod's relationship to the collection. For instance, if you would like to see all the time periods that intersect with a certain date, you can call the periodsIntersectedByDate: method. The result is a new TimePeriodCollection with all those periods that intersect the provided date. There are a host of other methods to try out as well, including a full equality check between two collections. Time period chains serve as a tightly coupled set of time periods. They are always organized by start and end date, and have their own characteristics like a StartDate and EndDate that are extrapolated from the time periods within. Time period chains do not allow overlaps within their set of time periods. This type of group is ideal for modeling schedules like sequential meetings or appointments. 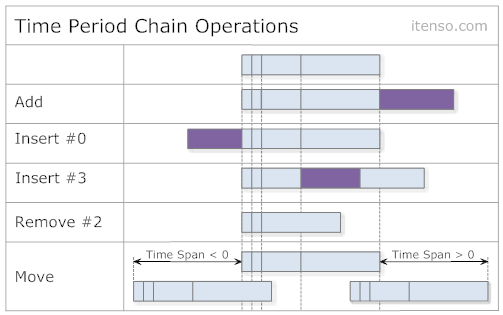 Any time a date is added to the time chain, it retains its duration, but is modified to have its StartDate be the same as the latest period in the chain's EndDate. This helps keep the tightly coupled structure of the chain's time periods. Inserts (besides those at index 0) shift dates after insertion index by the duration of the new time period while leaving those at indexes before untouched. Insertions at index 0 shift the start date of the collection by the duration of the new time period. A full list of operations can be seen below. 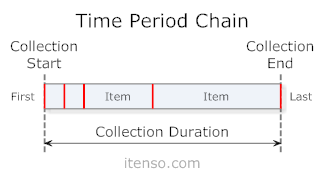 Like collections, chains have an equality check and the ability to be shifted earlier and later. Here is a short list of other operations. All methods and variables have been documented and are available for option+click inspection, just like the SDK classes. This includes an explanation of the methods as well as what their input and output parameters are for. Please raise an issue if you ever feel documentation is confusing or misleading and we will get it fixed up! Unit tests were performed on all the major classes in the library for quality assurance. You can find theses under the "Tests" folder at the top of the library. There are over 300 test cases in all! If you ever find a test case that is incomplete, please open an issue so we can get it fixed. A Swift and Objective-C compatible iOS calendar UI library that can be used to display a calendar of events within your app. iOS 7 Calendar with Infinite Scrolling. Only need 4 lines of code to set up.